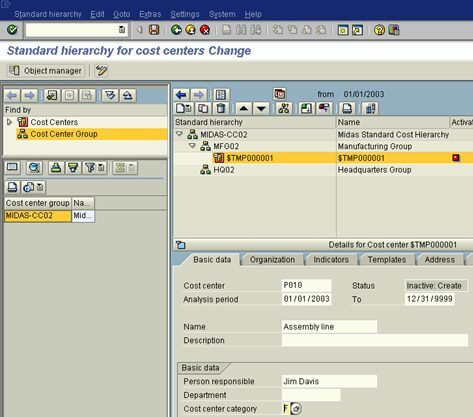 Click on the standard hierarchy group that you have previously created and enter a name for this group. Click the Create button and select Lower-level group. 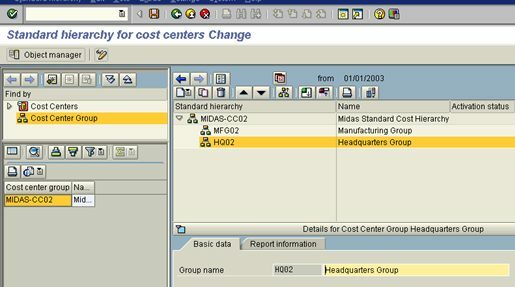 Enter a group name (MFG_ _) and the description, Manufacturing Group. Click the Create button and select Group at same level. Enter the group name as HQ_ _ and enter the description as Headquarters Group. Click the enter button. Click on MFG_ _ and click create. Choose the Cost Center option and enter a valid from date of 01/01/2003 to 12/31/9999. After ALL the above cost centers have been created, click Save.